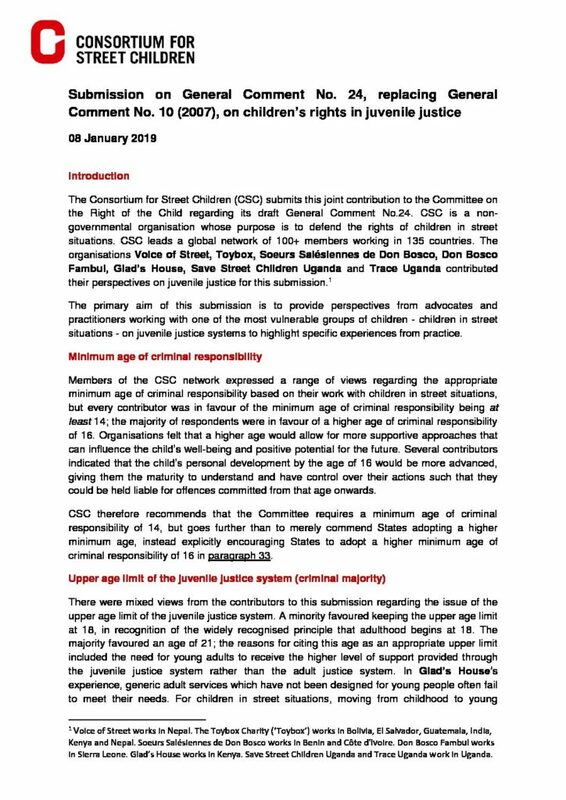 Consortium for Street Children, in collaboration with Voice of Street, Toybox, Soeurs Salésiennes de Don Bosco, Don Bosco Fambul, Glad’s House, Save Street Children Uganda and Trace Uganda, submitted this briefing to the UN Committee on the Rights of the Child in response to a call for comments on the draft revised General Comment on children’s rights in juvenile justice. The primary aim of this submission is to provide perspectives from advocates and practitioners working with street children on juvenile justice systems in order to highlight specific experiences from practice. The draft General Comment to which this submission responds can be read here.